We are always delighted to welcome new members into the life of the church. Baptism (‘Christening’) is the way in which we formally become part of the Christian family: it is both a profound sharing in the death and resurrection of Christ and a joyful affirmation of God’s love for each one of us. If you have not been baptized yourself, or would like to have your child baptized, please contact either one of the clergy or the parish office, and we shall be pleased to make the necessary arrangements. There are no age limits for baptism, nor is there any charge! It is an expression of God’s free and unlimited grace. 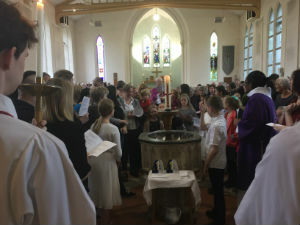 Wherever possible, we aim for baptisms to take place within the main Sunday Eucharist, with the regular congregation present to welcome the candidates. But we recognise that both for practical and personal reasons this is not always appropriate, so we also offer separate baptism services, usually at 12.15pm on Sundays. There is no formal preparation for baptism, but prior to the service the priest who is to take the service will arrange to meet with you to explain exactly what will take place. If possible, it is helpful if godparents can also be present on this occasion. We are only too happy to answer any questions you might have, and we want to do our best to make the service a relaxed and happy occasion for you and your family. Confirmation is the opportunity to profess for ourselves the faith in which we were baptized, and to receive the empowerment of the Holy Spirit. It involves receiving the laying-on of hands and being anointed with oil by the bishop, and it usually takes place within a large celebration of the Eucharist. It is an act of Christian commitment and therefore deserves thorough preparation. To be confirmed is not to undertake a social rite of passage; it is to promise publicly to surrender your life to Christ. As part of our regular church life we offer the Pilgrim Course for those who are seeking to deepen their knowledge and love of Christ. This provides ideal preparation for adults who would like to be confirmed, and we would encourage you to participate in it as fully as possible. Our annual confirmation service usually takes place around Pentecost, in the early summer, and the new cycle of the Pilgrim Course begins the previous autumn. As far as young people seeking confirmation are concerned, we run a Youth Emmaus Course on a similar basis to the Pilgrim Course, and we would likewise encourage potential candidates to join this during the autumn before they wish to be confirmed. They also might like to consider joining our Junior Church (Rox and Sox) if they are not already members. Specific teaching about confirmation itself is offered a few weeks before the service, and a rehearsal is always held in church. All candidates for confirmation must be baptized and must therefore be able to produce their baptism certificates in advance. Those who have not previously been baptized can be baptized during the service itself. Many children who regularly worship with us are admitted to communion some years before it would be appropriate for them to be confirmed. The Church of England permits this practice in cases where the children have the support and encouragement of their parents. We therefore organise preparation classes, as necessary, at which we provide the children with basic Christian teaching and explain the significance of the Eucharist. Parents are very welcome to attend these classes with their children. There is no specific age requirement, but we would suggest that this is most appropriate for children sometime during Key Stage 2. A number of our local schools are church schools, and some of them are under great demand for places. All of them have their own admission requirements, and prospective parents are encouraged to read these carefully, ideally several years before application has to be made. In most cases church attendance (both regularity and duration) is an important requirement, and at St Paul’s we are only too pleased to welcome new parents and their children, even if their impetus for joining us is their hope of eventually obtaining a place at a church school. What we ask from them is a real openness to the Gospel and a willingness to share our life as fully as possible. We also ask parents to sign the Church Attendance Register at the back of the church; it provides the evidence to enable Church Support Forms to be completed in due course.